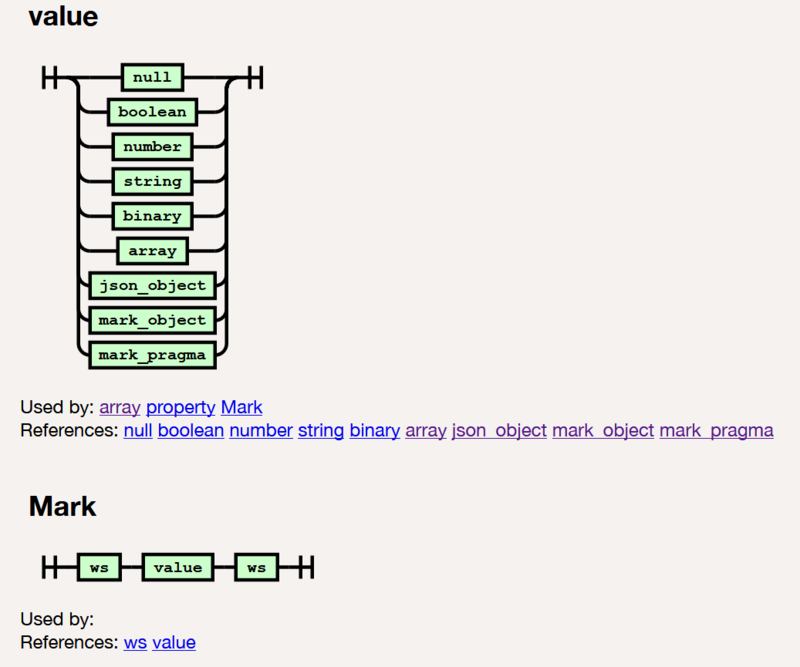 Mark syntax is a superset of JSON. The primary extension that Mark makes to JSON is the introduction of a new object notation to support markup data, commonly seen in HTML and XML. Optional list of content values following the named properties, which corresponds to child nodes in markup documents like HTML and XML. Property key and value can be unquoted if they’re valid identifiers. JS reserved keywords (like default) are valid unquoted keys in Mark. However, it is recommended that you avoid using JS keywords, or JS and Mark object prototype function names as property keys, as they could cause confusion, inconvenience and even errors (as the underlying functions are overridden). Comparing to JS identifier, Mark identifier allows dash ‘-‘ and dot ‘.’ in it. These two special characters are added as they are commonly used in markup formats, like HTML, CSS, XML. Property keys and values can be single, double or triple quoted. Property keys must be unique (for both Mark and JSON object). Comma between properties is optional, and last property can have trailing comma. To better support mixed content, not all Mark values are allowed in the contents of a Mark object. Array, number, boolean and null values are not allowed. Consecutive text values are merged into a single text value. Mark pragma is a sequence of characters enclosed in brackets ( ... ). It has two syntax forms. The general form is quoted in (? ... ? ), and the pair form is quoted in ( ... ). In the general form, character ? needs to be escaped with double ??. In paired form, no character needs to be escaped. It can contain embedded brackets, as long as they are balanced. Outer brackets are delimiters, whereas embedded brackets are part of the pragma content. It can be used for content like comments in HTML and processing instructions in XML, and embedded expressions in templates. Other syntax extensions made to JSON are pretty much just syntax sugars, some inspired by JSON5. Comma between array items are optional, and last item in array can have a trailing comma. Strings can be single or double quoted. Strings can split across multiple lines. String can also be triple-quoted with single or double quote character, similar to Python or Scala. The quoted sequence of characters is arbitrary, except that it may contain three or more consecutive quote characters only at the very end. Escape sequences are not interpreted. Unlike JSON string, control characters, like Tab and Line Feed, are allowed in Mark string. Actually, all Unicode characters are allowed in Mark string, just like JS string. Only double-quote (“), single-quote (‘) and back-slash (\) need to be escaped. Numbers can begin or end with a (leading or trailing) decimal point. Numbers can include Infinity, -Infinity, NaN, and -NaN. Numbers can begin with an explicit plus sign. Binary data can be encoded as a sequence of characters delimited by [#] and ]. It can encoded in either base64 or ascii85 (Adobe version) encoding. Whitespaces are allowed between the encoded characters and are ignored by the parser. Both inline (single-line) //... and block (multi-line) comments /* ... */ are allowed in Mark, similar to those in JS. One difference is that, Mark block comment can be nested, whereas JS block comment cannot be nested. The formal grammar specification in BNF is here. Following the JSON convention, a railroad diagram of the entire grammar is also provided to help you visualize the grammar. You can click on the grammar terms to navigate around. Below is a snapshot of the top-level of the grammar. mark is maintained by henry-luo.